I often do not realize how unique my experiences in Palawan are until someone tells me so. northernmost municipalities of Palawan. The suspected cause of death was a stonefish sting. The tragedy had everyone thinking twice before going for a swim. 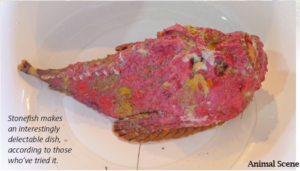 Not wanting to ruin everybody’s vacation, I tried to dispel misconceptions about the stonefish by separating fact from fiction. We human beings are afraid of things we do not understand but once we have a better understanding of the issues at hand, we can go on with our lives with confidence and peace of mind. stones that automatically come to mind. 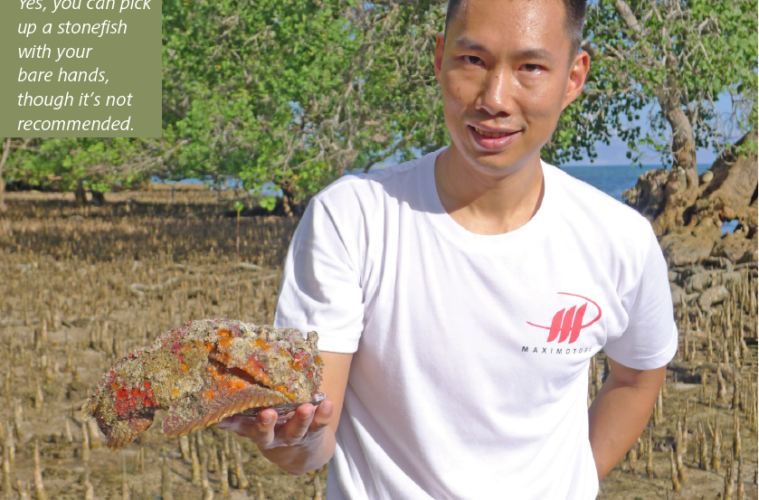 They look more like semi-round corals covered in green, red, orange, pink, or brown algae, and they may be spotted or plain, of a single color or multi-colored. The stonefish is so hard to see not only because it is shaped like a coral, but also because its skin texture is like that of a moldy or algae-y piece of rock that has been submerged in water for a long period of time. As if they weren’t already difficult enough to spot, there is also no limit to their color combinations and patterns. In fact, the only time that a stonefish can be fairly distinguishable (but in this context, still fairly indistinguishable) is when it has its pectoral fins or side fins fully spread out against a background color that is in sharp contrast with its own, or when it is swimming. Unfortunately, these two events are very unlikely to occur and no self-respecting stonefish will probably do these in front of you. not complacency, is always the word to remember. high tide to take them back to sea. When I was younger, I sometimes come across kids catching stonefish or ‘bantol’ as we call it. 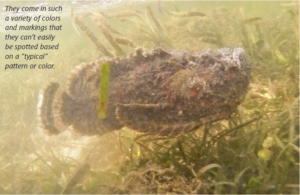 for prey to come to them; the stonefish gobble prey up when the latter gets close enough. They also do not move out of harm’s way, perhaps too accustomed to being given a wide berth by predators or not being noticed all their lives. I have experimented with a captured stonefish. We poked at it with a stick and instead of moving away like a good, normal fish, it just stayed put and raised its venomous dorsal fins. If we think about it, moving away will forfeit its greatest defense, which is being unnoticeable. So I guess it is stonefish common sense to just stay put no matter what. And that is also why they are very easy to catch once spotted (please do not attempt to catch a stonefish). You can just scoop them up with a net or even with bare hands. Can You Keep a Stonefish? Aside from its use as food and its potential as export fish, stonefish actually do well in salt-water aquariums. In fact, they are for the more sophisticated and advanced marine aquarium hobbyist. I am not an expert aquarium keeper, but from what I know of the stonefish, I can give basic advice on what you can or cannot do. The stonefish is immobile most of the time so there is no need for a very big aquarium, although bear in mind that this fish is bulky and needs some elbow room. 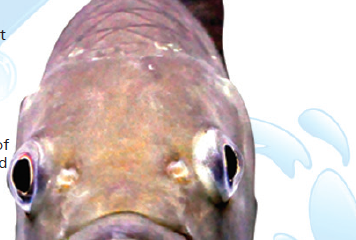 Putting it in a very large aquarium, however, may be detrimental to the other fish and to you. Remember, these fish are ambush feeders. They gobble up prey with their large mouths and do not chase food around the tank. If you have too much room, you have to put in more live prey and your stonefish will have a harder time filling its stomach. With a proper-sized tank and live prey (shrimp and other fish), the next thing that comes to mind is, can stonefish have tankmates? Remember that stonefish are carnivores and cannibals, even more so than the lapu-lapu which in my experience, when they are not fed enough, will try to swallow tankmates up to half of their size. Judging by the looks of the stonefish, which is basically a mouth and head with fins, I will not be surprised if it attacks a fish as big as itself. So I would think that this fellow better be the solitary occupant of your tank. Unless, of course, you have a very big tank and can afford to put in lots and lots of prey fish, which also have to be fed. (Editor’s note: Don’t forget that live prey means more cleaning of tank water!) Maybe the best gift you can give Mr. Stonefish is not a Miss Stonefish, but some really pretty stones or corals. They love to sit on top of or beside such aquarium decor. they can keep it alive in an indoor tank or bring it straight to the kitchen. Skylight Hotel, one of the popular hotel-restaurants here in Puerto Princesa City, cooks live stonefish really well. I never fail to order this dish whenever I bring my guests to this restaurant. Everyone is always reluctant to try the venomous fish, but once they do, they just cannot stop eating it. No wonder why the Chinese and Japanese love this fish. who is a doctor, a cousin were both stung by stonefish. Perhaps my doctor friend, who is an ER specialist, is in the best position to describe the pain, which she said was so much worse than that of a bullet wound. She’d been stung on her big toe, and though she requested the best anesthesia and nerve blockers that can be prescribed by local doctors, these, she said, had little effect on the pain. Whereas a local anesthesia would have done the job for a bullet wound in the same area, all the treatment she received offered little relief. shell out approximately US$ 1,000 for the anti-venom—which, incidentally, is not readily available in the Philippines. I want to close this article with the proper treatment for certain animal stings. sting neutralizes some of the poison. feel if hot water has begun burning his or her skin. Vinegar, while not useful for stonefish stings, is a very effective remedy for box jellyfish stings. This I have personally tried on myself. Vinegar somehow ‘cooks’ the tentacles that are still attached to your skin (kind of making jellyfish ‘kinilaw’), making them less potent and easier to remove. Do not rub sand on the stung area. I have also experienced being stung by the ‘tayung’ or black sea urchin. I was very fortunate that the spine came out completely when I pulled it out; it had gone about 1 centimeter into my foot. The sea urchin spine is very brittle and usually breaks when pulled out with tweezers. The boatmen and many of my friends claim that urinating on a stung area that has irretrievable spines (as they have broken) will alleviate the infection. Unfortunately, I was not able to try this, and thus cannot attest to its efficacy. 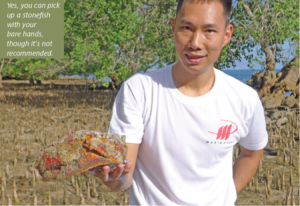 This appeared as “Palawan Encounters: Not Your Ordinary Pet… or Dish” in Animal Scene’s December 2015 issue.